A bit of bitterness leaves its stain I write this to you. I was never the best at anything in my life growing up, there seemed to always be someone better than me at sports, school, art, and pretty much anything else that I chose to pursue. But that never stopped me from trying my hardest at everything, I figured if I wasn’t naturally talented enough the only way to compete on the same level would be to work harder than everyone and truly dedicate my life to mastering my craft. It wasn’t easy but as the hours turned into days and months pushing my beading work ethic to its limits and now find myself in the position that I currently am in today. As Native American people even with the odds set up against us we continue to survive, adapt, and prosper over the years is truly what sets us apart from many other cultures. That’s why I fell that is important that we preserve our heritage and pass it down to the next generation for without that and our language we are nothing more than just ordinary people. Native American beaded hats have been around for many generations and are hard to place an exact origin. But If I had to guess it was probably someones’ grandma who would bead anything imaginable. I know a few of these people you go into their house and everything from candlestick holders to clocks are completely beaded, its quite fascinating to listen to them tell you in detail exactly how they made everything and why they did. Most of the time its just so that they could have something that no one else ever has had. Beaded hats are one of the easiest and fastest projects a beader can make, and not to mention they are a great way to make something unique no one that else will ever have. The hat that we will be using today comes to us courtesy of Mr. Hustle Tribe and the materials that will be needed will be 1 needle, nylon thread, scissors, an awl, ruler, and size 11 cut beads. To start your you’re going to want to thread your needle and locate the center of the front brim of the hat. From here it is all preference to how deep you want to bead into the brim. I chose 4 cm because there was no stitching around the brim that I could use as a guideline. So instead of using a ruler, I marked out the 4 cm line before punching my first hole directly downward in the center of the brim using the awl. The awl is used to pre-punch the holes so that the needle can easily pass through the thickness off the brim and save your fingers the struggle of pushing the needle. Starting from the bottom going upwards to hide the knot at the under the brim of the hat string your beads. 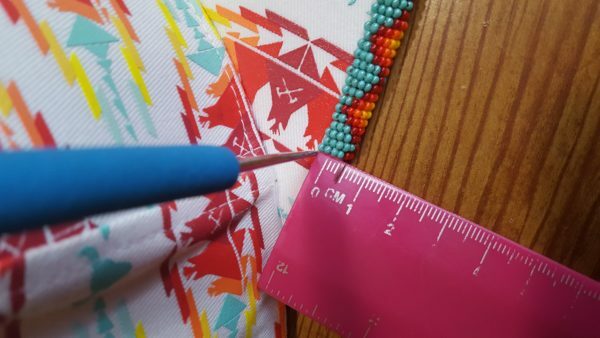 Depending on how deep you started your first hole will determine how many beads you will need to use to complete one stitch. Mine so happens to be 11 beads. At this point, I have a choice to make. I can draw on the hat and make a guideline on top and bottom of the hat exactly 4 cm all the way around the brim as a guideline or not draw on it and use a ruler to measure ever stitch before I pre-punch each hole. I chose the more difficult of the two strictly because the hat is white and no matter what I use to draw the line would stain the hat. When beading the hat using the awl and the stitching on the brim as a guideline you will find that this project is really simple. If you must draw a guideline keep in mind how it will affect the overall finished appeal of your project. After that, the only difficult part would be getting the spacing right in between the stitches. You don’t want to space out your holes too far to where you can see in between the beads but you also don’t want to punch your holes so close to each other that the beads become jumbled next to each other. There is a certain sweet spot in between that you want to find, and the only way to learn where it is is to you do it for yourself. Experience is really the best teacher and there is no way really to mess the hat up so bead with confidence and try to improve your spacing with every stitch. When you run out of thread simply cut you needle off double knot the thread then clip off the remaining thread. To restart where you left off at after re-threading your needle just go straight down the last hole you made and when finished with one side simply tie off and cut the thread again. For those wondering why too start beading the hat from the middle to the outside. This is done so that you can center your design directly in the middle of the hat and will help tremendously throughout the process. If I were to guess you never beaded before I would say it would take you up to 12 hours at most to finish the project. If you’re more experienced like me, to complete the hat with a guideline you can finish in 4 hours or less. I want to thank you for taking the time out of your lives to read this article please leave some feedback or if you have tips on how you bead hats please do comment below and until next time pow-wow nation happy beading my people and I can be found on all SSM. Wow! Artwork is really high caliber. This hat would be a reminder of your daily intentions. Thank you for sharing. I have been wanting to try it, I might get brave. We shall see.